If you have one, what is it, if you don't, what would you get? I would get a symmetrical tattoo on the back of my neck. And something that stays relevant regardless of rank. You don't want a ladder problem that is relevant to 20kyu players and then advance to 1dan, forever being marked with a beginners problem. Another consideration is that your skin does not have natural "edges", so a corner or edge problem can be an issue aesthetically. Some problems can remain significant to you even after you have solved it. 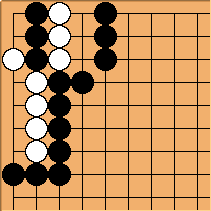 My 5dan teacher still talks about how the Crane's Nest Tesuji kept him awake at night when he first learned about Go. Personally, I have a Go problem that can be solved by a 16kyu player, but higher ranked players tend to take more time to solve it because the solution is quite unintuitive. For that reason I like it very much, and show it to everyone who studies Go with me. The only problem is that it is a corner tsumego, which may look odd on your body. If it weren't for that, I would probably get a tattoo of this problem.